This is a local re-post of a piece I just wrote for The National Interest. Basically my concern here is the regular over-reaction in the West to almost anything military North Korea does. Yes, I am a hawk on Pyongyang; and yes, I worry about the missile program as much as anyone. But I am always amazed at how much hyperbole North Korea can elicit from otherwise smart people who should know better. The missile in pic above got dubbed ‘franken-missile’ – exactly the kind of unnecessarily heated rhetoric that just scares the s*** of people but not much more. But I guess when folks in this area have to worry about what Dennis Rodman thinks, you have to allow them to lose their mind once in awhile. 1. The North Koreans lie. Just because the North Koreans say they have an ICBM hardly makes it so. Last year, North Korea claimed to detonate a hydrogen bomb. This was false. In trying to resolve the abductee problem with Japan, Pyongyang was nabbed returning incorrect human remains. The George W. Bush administration caught the North Koreans cheating on the Agreed Framework. Pyongyang’s lying on human rights in the North is of epic, orwellian proportions. Throughout various talks and engagement since the early 1990s, the North Koreans continued nuclear development even as they professed denuclearization. Without independent verification, I see no reason why we should accept North Korean claims on almost anything of significance. California is 5,500 miles from North Korea. No one has actually seen a North Korean missile with that sort of range yet, and the South Korea military is now reporting that the Hwasong-12 missile is just a medium-range rocket after all. In other words, Pyongyang lied. Firing short- and medium-range rockets into the Sea of Japan is hardly evidence the North can strike the Western Hemisphere. 2. North Korean guidance capability is unknown, and likely mediocre at best. There is also no independent verification that North Korea can actually guide a missile to narrowly defined target at a great distance. ‘Throw-weight’ – the thrust required to ‘throw’ a missile a long way – is necessary but not sufficient for an ICBM program. Dated Soviet technologies are generally considered to be the basis of the Northern missile program, and the Soviets always had trouble with guidance. In the 1970s ‘throw-weight debate,’ US conservatives worried about the sheer size of Soviet missiles, but their bulk was to compensate for the Soviets’ less precise targeting. A North Korean ICBM may eventually have engines large enough to propel it all the way to the Western Hemisphere, and that in itself is quite frightening. But actually striking a precise target like a city – rather just somewhere in the Rocky Mountains, for example – requires information processing and computerization, not just raw thrust. These are skills closed political systems always struggle to develop, and North Korea is sanctioned as well. The regular troubles of the North’s ‘space program’ illustrate this problem. This is not impossible of course; the Soviets/Russians and Chinese adapted over time. And almost certainly the North Koreans are working away at this problem. But there is no open-source information that North Korea has mastered this problem, and test-firing rockets into target-less sea spaces is not strong proof. Indeed, this is likely why North Korea has flirted with submarine-launched ballistic missiles; the shorter required range should improve accuracy. 3. The Northern elite is rational. One of the laziest tropes of pop North Korean analysis is that the Kim family is ‘crazy,’ ‘insane,’ and so on. Even Philippine President Rodrigo Duterte joined in the baseless alarmism this spring by suggesting that Kim Jong Un ‘wants to end the world.’ This makes for great comedy and outrageous villains in the movies but is almost certainly inaccurate. Were the Kim family suicidally mad, they have had many chances to launch a cataclysmic war. They never have. Crazy people do not rise to the top of powerful states, and if they were to somehow by quirk, they would not last long in the brutally competitive and dangerous politics of most autocracies. We may loathe Stalin, Mao, Hitler, Pol Pot and the rest, but they were not mentally ill (except perhaps at the end). This is part of why they are so frightening. Their atrocities – which required scale, planning, and complexity – would have been hard to perpetrate if they were insane. The Kim family would not have survived in the unforgiving northeast Asian neighborhood, nor against internal threats, were they not viciously rational, cutthroat survivors. Similarly, the Kims are not nihilists. They are dangerous norm-breakers, prone to violent outbursts, and have little concern for other people’s lives. But there is much evidence that they value their own lives and indeed use their position at the top of North Korean society to live quite indulgently. Suicide bombing is indeed a frightening element of the war on terror, but there is little to suggest that that applies here. In fact, the Kims are quite crafty and tactical – pushing when they can, pulling back when they must, playing their neighbors against one another for gain, and so on. This is not a suicidal, ideological, ISIS-like state bent on apocalyptic war but rather a post-ideological gangsterish dictatorship looking to survive. 4. Northern nuclear weapons are almost certainly for regime security, not offense. The best way to guarantee the North’s survival is nuclear deterrence. North Korea is globally loathed. Even China and Russia worry and would like to see it reform along the lines of post-communist Vietnam or China. Surrounded by enemies, and occasionally threatened by the United States, which has supported regime change in Yugoslavia, Iraq, Afghanistan, Libya, and so on, nuclear weapons are in fact an excellent Northern (read: Kims and elites) strategic choice. It is a rational decision, given Pyongyang’s goals to, 1) not change internally, and 2) not be attacked externally. Hawks occasionally suggest North Korean nukes could be used to force unification on Northern terms. Barring their use in a war, I do not see how that is possible, especially given the US-South Korean alliance. And if the North did use them in a unification war, US nuclear retaliation would obviate their value. Indeed, China might well invade an offensive, nuke-launching North Korea just out of sheer terror. Finally, it is hard to see North Korea’s ossified feudal system absorbing a larger, modernized people accustomed to liberal democracy. It is far more realistic to suggest that the North simply wants to hold what it has and sees nuclear weapons as an ultima ratio to do so. This is not ideal of course. Best would be a de-nuclearized North Korea. But this is highly unlikely at this point. South Korea and Japan have already slowly accustomed themselves to living with the Northern threat over the decades. And the US, after the hysteria of the Cuban Missile Crisis, learned to live with Soviet and Chinese capabilities to strike the homeland with nuclear weapons. Whether the US can also adapt to a North Korean ICBM is one of the great geopolitical questions of the next decade. Alarmism does not help. This entry was posted in Korea (North), Missiles/Missile Defense, Nuclear Weapons, Strategy, The National Interest by Robert E Kelly. Bookmark the permalink. Pyongyang disagrees about how hard unification would be with nuclear weapons, and I don’t think that they’re wrong. Pyongyang, May 22 (KCNA) — Han Ho Sok, director of the Reunification Institute in the U.S., gave a lecture on the subject “DPRK-U.S. nuclear standoff goes to end and the day of national reunification is approaching” in Tokyo of Japan on May 19 to mark the 45th anniversary of the July 4 joint statement and the 10th anniversary of the October 4 declaration. Attending it were Korean residents of different social standings from different parts of Japan. The lecturer referred to the fact that Western media are misrepresenting the truth about the Korean issue to mislead the world public with false reports. He urged Koreans in Japan to judge the developments with the Juche-based viewpoint as master of reunification. 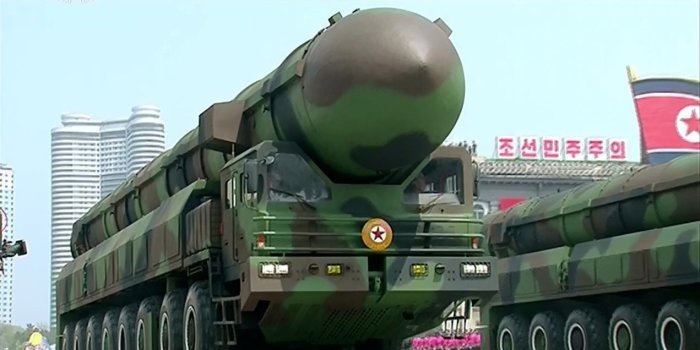 The tremendous nuclear deterrence of the DPRK was proved through the successful test-fire of Hwasong-12, a ground-to-ground medium-to-long range strategic ballistic rocket, on May 14, he stated. He stressed that when the DPRK wins in the nuclear standoff with the U.S., a radical turn will be brought in the way for Korea’s reunification desired by the entire nation. He called upon all Koreans in the north and the south and abroad to pool their efforts for building a reunified powerful country with confidence and optimism for the future. They’re not wrong because the alliance is not strong. Once the question becomes “Do we risk LA for Moon Jae-in,” Trump or whoever succeeds him after 2020 (depending on when they get the functioning ICBM) will say no. Could Trump go to nuclear war for a government led by man who speaks about learning to say no to America? Could Kamala Harris or Bernie or Elizabeth Warren or whoever? No. South Korea will then become Macau to North Korea’s China. Why wouldn’t there be talk of this being a game changer? As of today, the US-ROK Mutual Defense Treaty isn’t worth a warm bucket of piss.